If you use these code and data for your research, please be sure to cite our work (relevant publications can be found in each page). A database of images of four objects taken under natural illumination environments with calibrated ground-truth geometry and illumination. Each dataset contains the necessary intrinsic and extrinsic data to align the image data with the coordinate frame of the ground-truth meshes. A software package for defogging an image: factorizing a single foggy image into scene albedo and depth. It implements our Bayesian defogging method that leverages strong scene-specific priors on both the albedo and depth. This implementation uses non-linear optimization in lieu of graph cuts and achieves signifcant speed up. 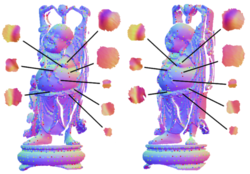 A software package for estimating surface reflectance and the (natural) environmental illumination from a single input image of objects with known geometry. It also contains a suite of programs to analyze and synthesize object appearance using the Directional Statistics BRDF (DSBRDF) model. 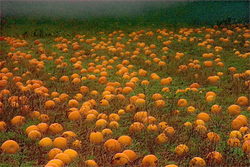 Images of 20 different textures, each of which is imaged approximately 2,000 times under different light source directions, at multiple distances, and with different in-plane and out-of-plane rotations. HDR images of 6 objects taken under 5 natural illumination environments with calibrated ground-truth geometry and illumination. We have augmented the Flickr Materials Database (FMD) of Sharan et al. with binary mask annotations for 13 visual material traits. 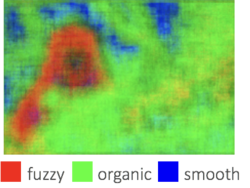 We consistently annotated FMD images with material trait masks that highlight only local regions indiciative of each trait. Two-Point Gait is an easy-to-compute body shape-insensitive image-based representation of human gait. The representation works by modeling the two-point statistics of optical flow fields to primarily encode the relative motion pattern of limbs in a gait cycle. Two-Point Gait provides a faithful representation of the pure gait of a person rather than entangling body shape and gait together. 3D Geometric Scale Space for extracting scale-dependent/invariant features, computing descriptors, and matching them for multiview, multi-scale range image registration. 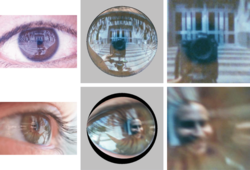 You can download VisualEyes, a software that allows you to compute a spherical panorama of the world surrounding a person and an image of exactly what the person is seeing from an eye in an image. It has been more than ten years since I worked on this, so I won’t be able to provide any support. 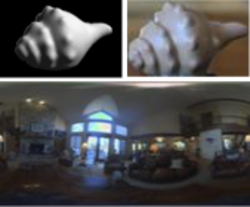 Parallel Simultaneous Registration for robustly aligning multiple range images.